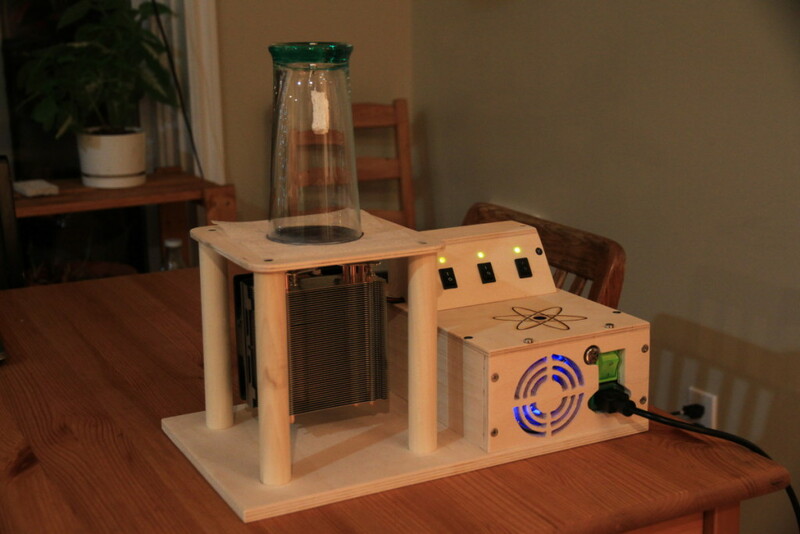 In this post, I will talk about my latest project: a Cloud Chamber. It involves woodworking, electronics and particle physics. But first, let me tell you what it does. It was originally invented by Charles Thomson Rees Wilson to study the properties of clouds. However, Wilson used it later to create cloud trails left after the passage of ions and radiation through the chamber. With the invention of the cloud chamber, Wilson won the Nobel prize in 1927. Here’s my own cloud chamber built using 2 peltier modules (TEC1-12709 & TEC1-12710), a 500W ATX power supply and a Cool Master Hyper 212 EVO heatsink. To fully understand how the chamber works, we need to understand what happens at the atomic level. When a charged particle travels through matter, it charges the atoms and molecules around it. The newly created ions attract or repulse each other. In a cloud chamber, the matter is alcohol vapour. The bottom of the chamber is cooled down to -40 degrees Celsius where a thin super saturated layer of unstable vapour appears. When a charged particle travels through it, it seeds a trail of ions which act as nucleation points for the alcohol vapour. Droplets are formed when the alcohol returns to the more stable liquid state. Therefore, the trail we observe in the chamber is the path that was taken by the ionizing particle. Particles have a mass, a charge and a speed. In general alpha particles (2 neutrons and 2 protons) are heavy and travel slower than protons which in turn travel slower than electrons. Fast particles lose less energy than slower ones (loss of energy is 1/v²). Thus, alpha particles create more ions (60,000 ions/cm compared to 50 ions/cm for an electron with the same energy) which translates into large trails. While protons have the same amount of charge (+1) as electrons (-1), they are 1836 times more heavy and therefore travel usually much slower which means they lose more energy by ionizing nearby particles. Most of the particles observed in the cloud chamber are electrons, alpha particles, protons, positrons and muons. Here is a video I made after completing my cloud chamber. Electrons and alpha particles can easily be differentiated.